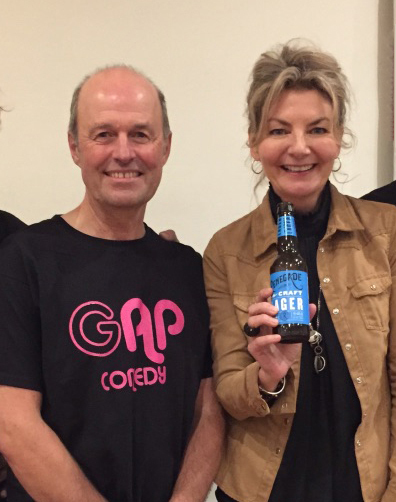 Following on from their successful event in December hosting Phill Jupitus Gap Comedy opened its 2019 programme with another well-respected name from BBC TV and Radio 4, Jo Caulfield. Goring Gap News she’d been handed in the Green Room and immediately won over the audience with her take on local affairs and the inevitable comparison between our two villages. From her arrival at Goring Station she concluded that Goring could easily be a location for Midsomer Murders (an impression bolstered by GGN’s centre-spread images of the torchlight procession!). She waxed lyrical about the attractive local properties and wealth of local shops on her route to the Miller of Mansfield, contrasting the civilised interior of the gastropub to those of the hostelries in her ‘up and coming’ home town of Leith where “you’re never quite sure whether you’ll experience an organic craft ale or a glassing”. Her ensuing set was a masterclass in observational comedy, the best material including a deconstruction of long-term marriages and the ‘investment’ women make into moulding partners into ‘finished product’ over many years. The couples on the front row became targets for her analysis of how successful this process has been – to much hilarity. It sounds painful but Caulfield executed it with charm and warmth, and the audience reciprocated accordingly. Drawing on her own relationship with husband Stewart, Caulfield hilariously analysed the differences in how the sexes interact, “women are interested in what’s going on with other people’s lives – but don’t actually care about them – men just meet up to exchange facts about football and Land Rovers!” She had tapped a rich vein of humour and her act demonstrated why Jo Caulfield remains one of the sharpest comediennes in the business. GapComedy is currently planning more shows for later in the year – if not already signed-up the mailing list, do so at www.gapcomedy.co.uk to ensure you are among the first to hear about them when they are announced.